VRF/VRF technology — the future of air conditioning is here. During the past 30 years, air conditioning technology has made incredible breakthroughs in efficiency, customization and comfort. One of the most important advances has been the development of Variable Refrigerant Flow (VRF), also known as Variable Refrigerant Volume (VRV) technology. How is VRF/VRV different than traditional HVAC systems? Most traditional air conditioning systems are either totally “on” or “off”. When your thermostat tells the outdoor unit to cool your home, your compressor runs full power until the desired temperature is reached. When the temperature in your home dips — even just one degree — the compressor will kick in at full power again to get your home back to the desired temperature. This is a highly inefficient process that consumes a great amount of electricity and places an inordinate amount of strain on your compressor. VRF/VRV technology stresses efficiency and home comfort by offering precise compressor regulation. When your thermostat tells your system to cool your home, it will examine the outdoor temperature, assess indoor requirements, and calculate the exact rate at which the compressor should run to reach the desired comfort level. This not only creates a climate that is perfectly controlled, it also offers significant gains in efficiency and reduced wear on your compressor. Energy Savings: Because VRV/VRF regulates the power output of the compressor, instead of just putting it on 100% all the time, it uses significantly less energy than traditional systems. Heating: In addition to the cooling benefits that this technology provides, VRF/VRV systems also offer heat pump technology that can warm rooms to the desired comfort level — even when the outside temperature is close to zero degrees. Multiple Zones: You can connect multiple zones — all with their own thermostats — to a single condensing unit for total indoor comfort control. Is VRF/VRV right for you? 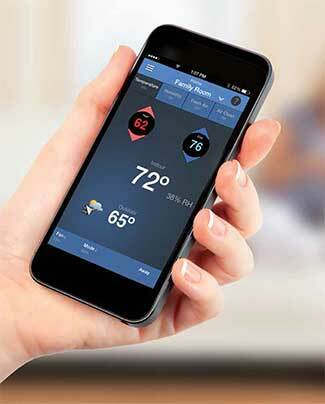 When you need highly customized climate control of individual indoor spaces (such as bedrooms, office units, etc. ), VRF/VRV technology could be a perfect match for your home or commercial space. Call an expert at Comfort today and schedule an appointment with one of our air conditioning experts. We install the finest VRF/VRV systems, precisely matched to your needs. Our experienced team of engineers and technicians will design and install the VRF/VRV system that perfectly aligns with your home’s or businesses’ needs — and we use only the best VRF/VRV systems in the business. Since 1982, Daikin has been at the forefront of VRV/VRF technology. This extensive experience has allowed them to create systems that are incredibly cost effective, highly customizable, quiet and reliable. Individualized comfort and maximum efficiency is what Daikin VRV is all about. LG’s highly efficient Multi V VRF systems provide excellent heating or cooling for any space. These systems offer humidity and individual temperature control for each unit, which allows simultaneous heating and cooling in different zones. Offering many of the benefits of traditional VRV/VRF systems, Mitsubishi City Multi systems have the added benefit of being designed to work in the strictest aesthetic confines, making them a premier choice for mechanical engineers worldwide.